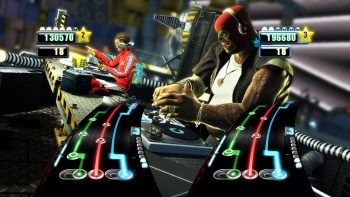 Activision CEO Bobby Kotick says it was the dramatic failure of DJ Hero that led to the decision to pull the plug on the Guitar Hero franchise. Guitar Hero stands as one of the most spectacular rise-and-fall stories in the history of the videogame industry. It single-handedly created what was briefly the most popular genre on the market, led Activision to spend nearly $100 million to acquire publisher RedOctane in 2007, and then as suddenly as it had appeared, it was gone. Activision closed down RedOctane in early 2010 and announced the end of the Guitar Hero franchise a year later. It's enough to make a person wonder, what the hell happened? According to Kotick, DJ Hero happened. "We were resting on the idea that one of the essential fantasies of videogames is to unleash your inner rock star," he said in an interview with Forbes. "And it didn't really matter how you did that, but as long as you were allowing people to unleash their inner rock star fantasies, you'd continue to be successful. So we went off on a passion project that had a point of differentiation - which is called DJ Hero." The problem, he explained, and which he admitted the company probably could have figured out fairly easily if anybody had bothered to stop and think about it for a minute, is that it's relatively easy to unleash your inner DJ in the real world, with a simple deck or a Mac, leaving the game with "a very small market." But because Activision was so focused on DJ Hero, Guitar Hero was left to coast, with predictable results. "It was the double whammy of DJ Hero was unsuccessful, and then Guitar Hero became unsuccessful because it didn't have any nourishment and care," Kotick said. "So we made what I think was exactly the right decision last year. We said, you know what, we need to regain our audience interest, and we really need to deliver inspired innovation. So we're going to take the products out of the market, and we're not going to tell anybody what we're doing for awhile, but we're going to stop selling Guitar Hero altogether." But he also reaffirmed that Guitar Hero is not dead, just resting for awhile. "We're going to go back to the studios and we're going to use new studios and reinvent Guitar Hero," he added. "And so that's what we're doing with it now."